It’s no secret that back in the mid 1980s, downtown wasn’t what you’d describe as vibrant. No basketball arena. An aging convention center. Dated city hall. No shopping. Sing High, The Matador, and precious few other restaurants of consequence. It’s no secret that back in the mid1980s, downtown wasn’t what you’d describe as vibrant. No basketball arena. An aging convention center. Dated city hall. No shopping. Sing High, The Matador, and precious few other restaurants of consequence. Meanwhile, cities across the nation were erecting formidable mixed-use developments that served as landmark entertainment destinations. 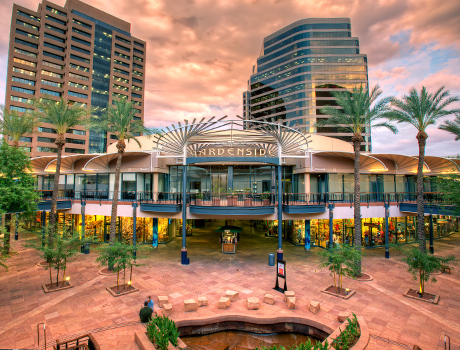 PCA hadn’t yet been organized but one of the organization’s patriarchs, Marty Shultz, orchestrated a land deal that would eventually become Arizona Center, which in the early 1990s was the biggest attraction in Phoenix. Today, Arizona Center is experiencing a comeback of its own as its remaining two parcels are poised to be developed into a residential high-rise tower and a new hotel. "As a long time member of Phoenix Community Alliance, it is especially gratifying to see how diverse the revitalization and development projects are in the Central Phoenix Corridor. The heart of Phoenix is alive and well". "PCA is striving to complement city - building with community building...bringing in new voices - residents, neighborhoods, and businesses large and small - for a stronger, more inclusive alliance of the Phoenix community".